Redeemer’s University massive job recruitment. 85 positions are currently vacant. Application deadline is August 14, 2015. Computer Literacy is a requirement for all positions. Redeemer’s University career/recruitment —– Applications are invited from suitably qualified candidates for appointment into several Academic and Non-Academic positions in the Redeemer’s University of Nigeria (RUN), Ede, OSun State, Nigeria. Redeemer’s University Career/Recruitment – Conditions of Service. In addition to the conditions of service obtainable in similar institutions of higher learning, the Redeemer’s University offers an enhanced remunerative package designed to attract high quality candidates committed to actualizing the vision of the University. Computer Literacy is a requirement for all positions. Redeemer’s University Career/Recruitment – Available Positions. Redeemer’s University Career/Recruitment -Method of Application. Candidates are required to complete their applications online through the University website: http://recruitment.run.edu.ng in addition to submission of hard copies to the Office of the Registrar, Redeemer’s University, P.M.B. 230, Ede, Osun State. 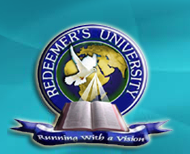 Redeemer’s University Career/Recruitment – Application Closing Date. The closing date for the submission of the applications is Tuesday, 4th August, 2015.